The day NASA's Voyager 1 spacecraft made its closest approach to Saturn, it revealed the kinks in one of Saturn's narrowest rings. The nature of Saturn's F ring was one of the biggest surprises of the Voyager spacecraft encounters with Saturn. The image on the left from Voyager 1 was released on Nov. 12, 1980. The image on the right shows a closer view of the F ring obtained by NASA's Cassini spacecraft on April 13, 2005. The moon Pandora is to the left (exterior) of the ring and the moon Prometheus is to the right (interior) of the ring. Voyager discovered the two moons Prometheus and Pandora, but images from Cassini spacecraft, in orbit around Saturn since 2004, finally allowed scientists to understand how the two moons sculpt the ring's kinked shape. Data from Cassini show how the gravitational pull of the moons sloshes ring material around, creating wake channels and triggering the formation of clumps as large as 20 kilometers (12 miles) in diameter. Scientists have also made a movie from several Cassini images taken on April 13, 2005, available here. The puzzling hexagon-shaped weather pattern around Saturn's north pole was first found in images from NASA's Voyager 2 spacecraft. In 1988, David A. Godfrey, of the National Optical Astronomy Observatories, Tuscon, Ariz., used images obtained by Voyager 2 in 1981 to create the mosaic image on the left. He added a grid showing latitude and longitude. The mosaic image on the right was created from images obtained by NASA's Cassini spacecraft on Jan. 3, 2009. Cassini has obtained higher-resolution pictures of the hexagon – which tell scientists the hexagon is a remarkably stable wave in one of the jet streams that remains 30 years later. But they are still not sure what forces maintain the hexagon. Scientists first saw these somewhat wedge-shaped, transient clouds of tiny particles known as "spokes" in images from NASA's Voyager spacecraft. They dubbed these features in Saturn's B ring "spokes" because they looked like bicycle spokes. An electrostatic charge, the way static electricity on Earth can raise the hair on your arms, appears to be levitating tiny ring particles above the ring plane, but scientists are still figuring out how the particles get that charge as they analyze images from NASA's Cassini spacecraft. The image on the left was obtained by Voyager 2 on Aug. 22, 1981. The image on the right was obtained by Cassini on Nov. 2, 2008. Before NASA's Voyager spacecraft visited Saturn in 1980 and 1981, scientists were not sure whether Saturn's moon Titan had a thick or thin atmosphere. Using images such as the one on the left, taken by Voyager 1 on Nov. 12, 1980, scientists learned that Titan was shrouded in a thick haze of hydrocarbons in a nitrogen-rich atmosphere. The finding led scientists to predict there could be seas of liquid methane and ethane on Titan's surface. This lake, known as Ontario Lacus, has a surface area of about 15,000 square kilometers (6,000 square miles), slightly smaller than its terrestrial namesake, Lake Ontario. Voyager 1 approached within about 6,500 kilometers of Titan's surface. Cassini has approached to within about 880 kilometers of Titan's surface. 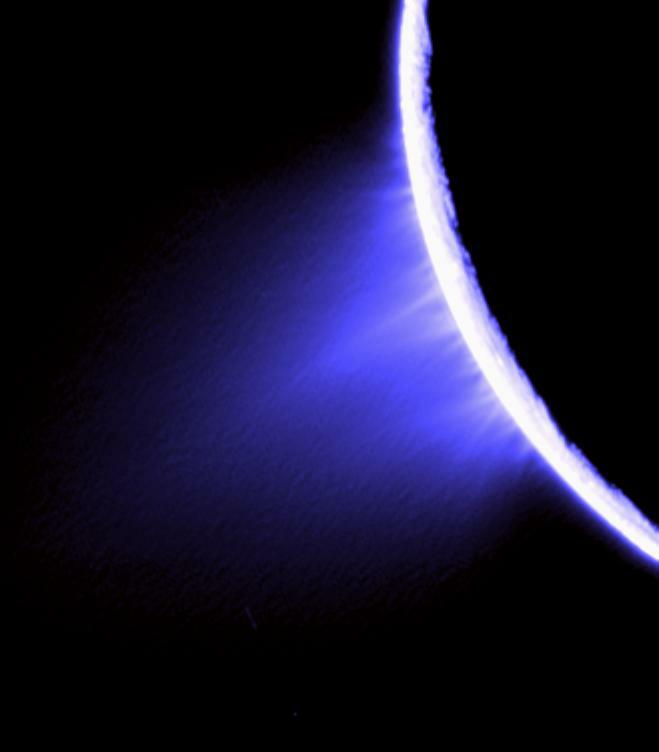 NASA's Voyager spacecraft were the first to take images of Saturn's moon Enceladus close-up in 1980, but it wasn't until NASA's Cassini spacecraft visited the icy moon in 2005 that scientists discovered jets of water vapor and organic particles shooting from the surface. The mosaic image on the left was made from images obtained by Voyager 2, which flew to within about 87,000 kilometers of the icy moon's surface in 1981. The images were taken on Aug. 25, 1981. From images like these, scientists learned that Enceladus had half-young, half-old terrain. 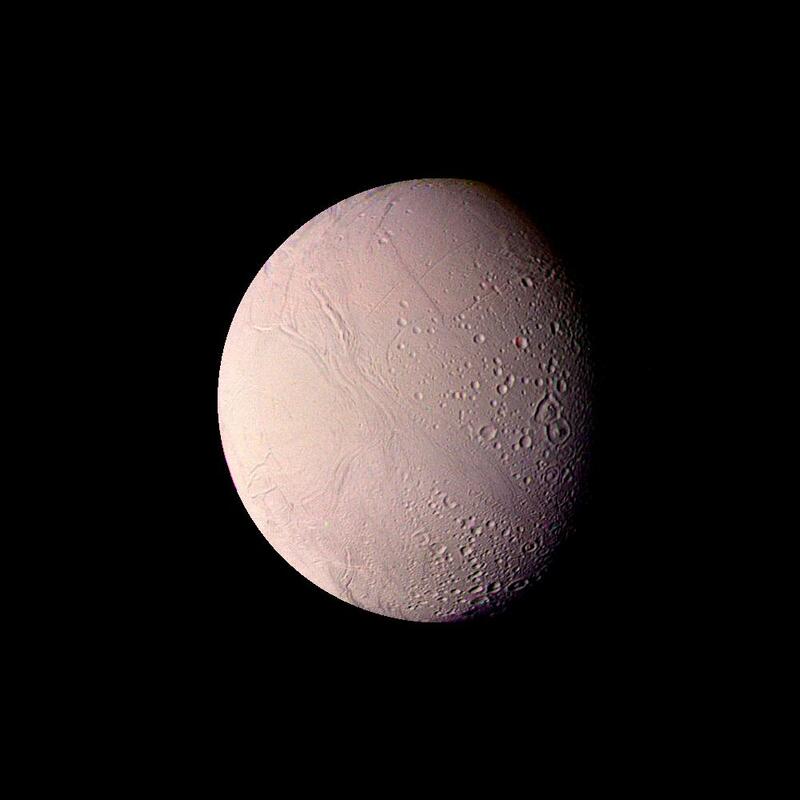 They inferred that Enceladus must have had some kind of recent geological activity. Cassini mission planners made sure to include a scan of Enceladus's south polar region, an area that Voyager 2 was not able to image. Magnetic field data from Cassini's magnetometer instrument, followed by heat mapping from the composite infrared spectrometer and images from the visible-light cameras revealed the presence of a plume flaring out of vast fractures on the surface. Scientists then realized that plume material falling back onto the surface and churning ice underneath could continually repave the "young" terrain of Enceladus. The image on the right was obtained by Cassini on Nov. 27, 2005. A closer view of one of the fractures, nicknamed "tiger stripes," can be seen here. Data from Earth-based telescopes did not prepare scientists working with NASA's Voyager spacecraft for their first images of the individual storms roiling Saturn's upper atmosphere. The image on the left from Voyager 1 shows convective clouds in the northern hemisphere of Saturn on Nov. 5, 1980. NASA's Cassini spacecraft was able to follow up on Voyager's discoveries. The right hand image shows the so-called "dragon storm" from September 2004. The storm was a powerful source of radio emissions detected by Cassini. The radio emissions resembled short bursts of static generated by lightning on Earth. In August 2009, Cassini was finally able to capture visible-light images of lightning flashing in Saturn's atmosphere. A movie combining the imaging data and the radio emissions can be seen here.